Born Leonardo Liotta on January 14, 1932 in Boston, MA. DeMarco began boxing at 12 and showed promise early. A converted southpaw, he turned pro in 1948 at 16, borrowing the name of a friend, Tony DeMarco, to circumvent the legal fighting age of 18. He was soon meeting the top lightweights and welterweights of the era including Paddy DeMarco (W 10), Teddy Davis (W 10), Chris Christensen (TKO 6), Pat Manzi (TKO 1) and Jimmy Carter (D 10). On April 1, 1955 he upset Johnny Saxton via 14th round TKO to become welterweight king at Boston Garden. He defended his belt against Carmen Basilio in Syracuse, NY and was stopped in the 12th round of a pitched fight that endeared both battlers to fight fans. DeMarco rebounded with a first round TKO over Chico Vejar to earn a rematch with Basilio in Boston. In a near replica of their first battle, Basilio again stopped DeMarco in the 12th round of an epic war that earned “Fight of the Year” honors. 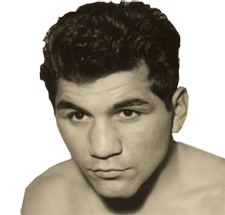 DeMarco resumed his winning ways with wins over Wallace “Bud” Smith (TKO 9), Vince Martinez (W 10), Kid Gavilan (W 10), Gaspar Ortega (W 10) and Don Jordan (KO 2) before retiring in 1962 with a record of 58-12-1 (33 KOs). Honored with a street and statue in his hometown, he is revered as one of the most popular figures in Boston boxing history.